Held at the iconic London Hilton Hotel on Park Lane, Manor Service Stations were invited to attend the prestigious Forecourt Trader of the Year Awards 2014. Having being nominated, Manor Service Stations were shortlisted as finalists in the West Country & Wales up to 2.5MLPA category. Taking place on Thursday 18th September, The Forecourt Trader of the Year Awards is considered to be the highest accolade for any petrol retailer so to just be shortlisted is a huge honour. The awards provide recognition of the highest operating standards along with entrepreneurial skills and imagination demonstrated by petrol retailers nationwide. With a Brazilian World Cup theme, the occasion was hosted by special guests and football pundits Ray Stubbs and Mark Lawrenson in front of a sold out, record number crowd. The Manor Service Stations owned Dingle Hill Service Station located in Colwyn Bay, Conwy, came up against tough competition as part of a 3 service station shortlist. With tensions brewing, Manor Service Stations picked up the award to cap off a wonderful year with the event proving to be the perfect place for the team to celebrate amongst their peers. On behalf Manor Service Stations, we would like to thank the team for their hard work in winning this award. 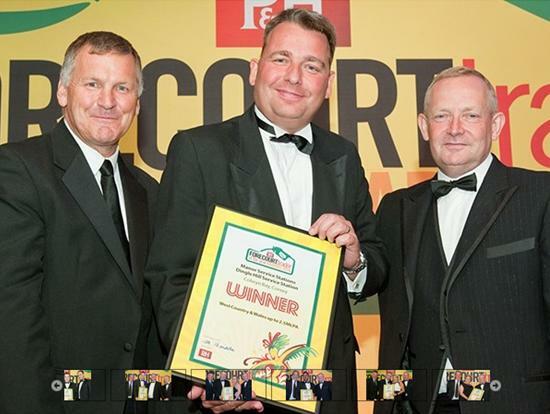 You can check out highlights from The Forecourt Trader of the Year Awards 2014 below.